Vietnamese shares slid further in the early session as investor confidence remained low after the British people voted to leave the European Union (EU). The benchmark VN Index on the HCM Stock Exchange fell 1.2 per cent to close at 613.27 points. The HNX Index on the Ha Noi Stock Exchange dropped 1.3 per cent to end at 82.53 points. Investors remained worried about how global economies may be affected following the British referendum. At the end of the early session, the property sector was the strongest decliner among all the 20 sectors on the stock market. The property sector was pushed down by FLC Group (FLC), Phat Dat Real Estate Development Corp (PDR), Tan Tao Investment and Industry Corp (ITA) and Sai Gon Thuong Tin Real Estate JSC (SCR). FLC was down 1.7 per cent, PDR slumped 3.5 per cent, ITA slipped 2.3 per cent and SCR declined by 2 per cent. Blue chips continued to weigh on both markets. Vietcombank (VCB), dairy firm Vinamilk (VNM), consumer goods producer Masan Group (MSN) and insurer Bao Viet Holdings (BVH), all moved down from Friday's closing prices. 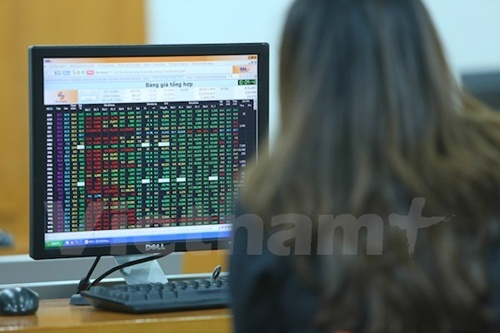 Investors on both local markets exchanged more than 85 million shares worth VND1.4 trillion (US$63 million).